Tension springs are mainly used to hold two components together, providing some degree of elasticity. The coils are wound very tightly in a state of rest, if you have springs that are showing signs of sprain (gaps showing between the coils), you need to replace them. 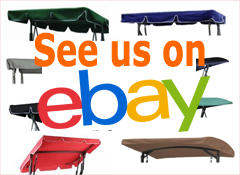 Our springs come in various lengths and have a weight rating of from 75Kg to 200Kg and are perfectly suitable for use with Garden Swings, Hammocks, Punch-bags, etc. The hooks can be either in-line (often known as 'S' shaped) or at 90 degree angles to each other (see below). 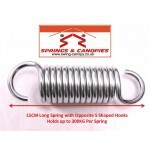 Strong Spring 9.5cm 5-Coil S ShapeHeavy duty springs. 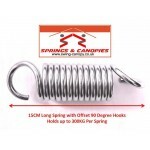 The hooks on this spring are S shaped - ..
Strong Spring with 90 Degree Angle 9.5cm 5-Coil Heavy duty springs. 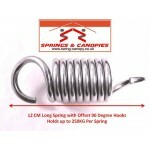 The Hooks on this spr..
Strong Spring 12cm 8-Coil 'S' ShapedHeavy duty springs. The hooks on this spring are S shaped - faci..
Strong Spring with 90 Degree Angle 12cm 8-CoilHeavy duty springs. 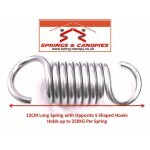 The Hooks on this spring are..
Strong Spring 15cm 13-Coil 'S' Shaped Heavy duty springs. 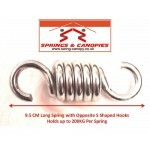 The hooks on this spring are S shaped..
Strong Spring with 90 Degree Angle 15cm 13-CoilHeavy duty springs. The Hooks on this spring ar..